Boy Scout Peter Conerty of Indianapolis had a problem, but with God’s help he was able to transform it into a challenge, an opportunity and a gift. His first five ideas for potential Eagle Scout projects at several Catholic schools and parishes in Marion County didn’t work out for various reasons. So Peter and his father, Joe Conerty, sat down to discuss the dilemma again late last year. The Cardinal Ritter High School junior from St. Michael the Archangel Parish wanted to do an Eagle Scout project that would benefit the Church in some way—a service project that he could organize, supervise and complete with help from members of Boy Scout Troop #400 in the Indianapolis West Deanery. And he wanted it to be the kind of project that would make a lasting difference in people’s lives, especially in their faith lives. His parents offered encouragement to Peter, who has been active in the Boy Scouts for six years. What the Scout needed was a little divine inspiration, which came late last year—not long after the father-son discussion about his project—in the form of a request from someone that his family knows well. Sister Mary Ann asked Joe Conerty, a regular adorer at the perpetual adoration chapel adjacent to St. Michael Church and Cardinal Ritter High School, if his son, Peter, was still looking for an Eagle Scout project. She needed a way to share the image of Jesus with the public, and Peter was happy to help her with the outdoor project at the chapel. The St. Francis Center, which is located at 3356 W. 30th St. behind St. Michael Church, houses the perpetual adoration chapel as well as two tabernacles in small convent chapels cared for by Sister Mary Ann and the Franciscan Sisters of the Immaculate Heart of Mary from India. With Peter’s supervision, 14 Scouts helped him build the sturdy wood and plexiglass case to display and protect the Divine Mercy image on May 22 then install it in front of the St. Francis Center. 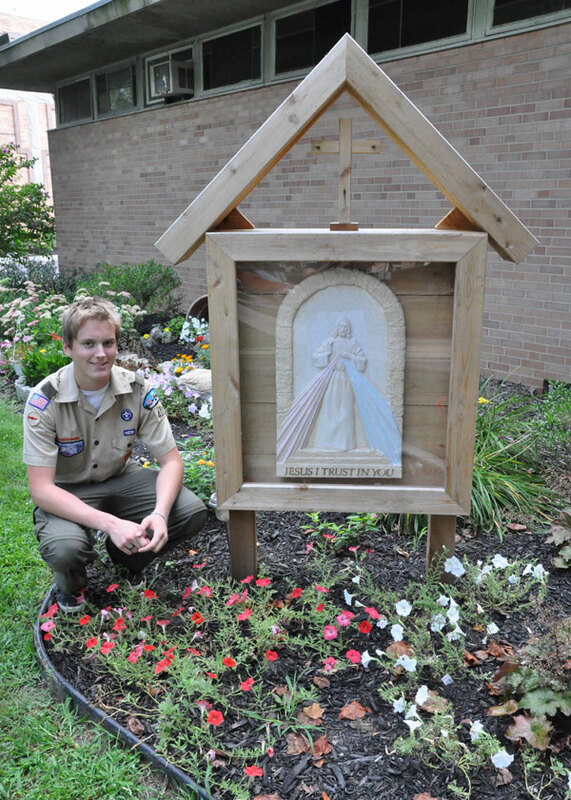 “Creating a special display for Jesus made me feel good,” Peter said as he prepared his presentation for the Scouting board review committee on Aug. 18, which resulted in him achieving his Eagle Scout rank at the start of his senior year in high school. Thanks to Peter’s project, countless people will see the Divine Mercy image of Jesus when they go into the St. Francis Center or pass it on their way to Cardinal Ritter Jr./Sr. High School. Sister Mary Ann is especially thrilled that the large Divine Mercy image of Jesus is prominently displayed in a weather-proof case angled toward the street and the center’s entrance. The installation of the display case near the center’s front door was especially challenging, Peter said, because underground roots and pipes limited its placement in the flower bed on the left side of the concrete sidewalk. As the late May afternoon turned to evening, Sister Mary Ann said she became concerned because there wasn’t a special light to illuminate Christ’s image at night.